I only heard of this movie after watching the 83rd Academy Awards and seeing how the movie bragged a lot of awards. It must be that great of a movie. Indeed, it was. The King's Speech was about the story of King George VI of Britain and how he managed to battle through his own personal struggle with the help of a speech therapist to prove that he was worthy of the throne. The story was predictable. However, the script was very well written. The casting was perfect as it showcased great performances by different actors like Geoffrey Rush and Helena Bonham Carter. But, the main man here was Colin Firth. He was superb and truly deserving of the award for best actor. Firth did an amazing job of bringing the character into life. In fact, I could say that this movie was totally about him. As they said, this was one of his best performances in movies if not in the entire cinema history. I've never really been into the lives of those royalties. However, in this case the story was presented in a more personal way. It could spark the royalty present in each one of us. The story was not just about them or King George VI. It could also be about us and our own personal struggles in life. That made it more interesting and worthy of watching. Overall, I'd also give this movie a 10. That is because I can do away with the predictability of the story with an excellent script, a playful cinematography and superb acting. 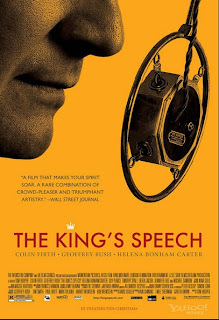 The King's Speech is one of the best movies of 2010.